How many times do you find yourself traveling and wish there was a way you could give back? Help someone? We incorporate philanthropy and photography into all of our treks, be it the Everest base camp tours or the Gokyo lake trek. During the last adventure trek in Nepal wherein we had visited the Base of Everest we brought solar lanterns. Solight Design was kind enough to donate a case of lanterns to our group. They are a global social enterprise delivering affordable solar lighting and power solutions to the world. Their mission is to provide clean sustainable light and power to those who need them most. There are over 1.6 billion people who have no access to electricity and clean sustainable lighting and energy, something most of us take for granted. Our Sherpas fastened Solight Lanterns to our duffels, so they were charged and ready to hand out as we came across those in need. Ever meet a Sherpa potato farmer? See where they live? Wonder where they possibly keep a crop of potatoes throughout the harsh winters? We met a wonderful Sherpa family in Dingboche on our way up to the Base of Everest. They live in a typical low ceiling Sherpa home with very little windows and hardly any light. Winters are long and cold. The rainy season is damp and cold; the warm months are far and few in between. Potatoes are the main crop and source of food for many in the Khumbu Valley. Once the potatoes are harvested they are buried in a huge hole in the ground for the winter. Each spring families will dig up their crop of potatoes and sell them to local tea houses or at local markets. Typical Sherpa families use their wood stoves not only for heat, but to cook and as a source of light. Many families have been living in their homes for over 20 years. 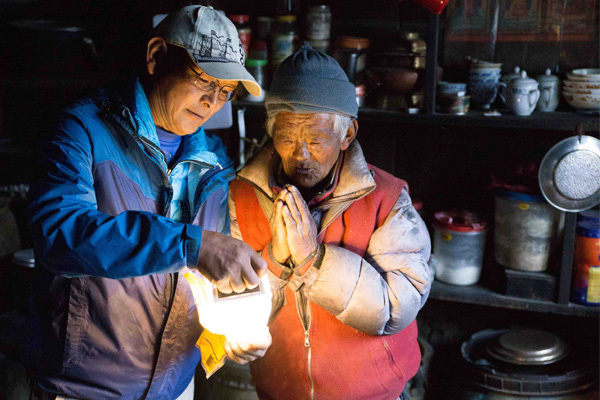 Most homes in the Khumbu Valley don’t have electricity, but even those that do it often doesn’t work. Their electricity either comes from the power the rivers generate or solar. It’s not dependable. When we knocked on their door with a lantern as a gift, not only did their faces light up, their living area did too. Ever wonder wear the porters sleep? Many villages created a place to call home for their porters. It’s a dorm style building where the porters, people who carry most of the gear up to the Camps of Everest, live in between loads. A Porter House can accommodate up to 30 men in the busy season. Every Porter House has a common kitchen run by villagers. Yet they don’t have light. One single lantern can light up most Sherpa kitchens! Sherpas by nature are warm caring people. FhuDorge Sherpa heard about the lanterns and asked if he could have a few to take up to the top of Everest. Imagine a vast, flat area of endless snow surrounded by deep crevasses and mountain walls. Camp 4 sits on a plateau resembling a moonscape. Your tent sits at the edge of the atmosphere and the sky owns a strange, dark, blue color. The Solight lanterns warmed the tent at night by providing light for those climbers that were so close to achieving their childhood dream of summiting Everest. I can’t explain how it feels to give the gift of light. It’s something so easily taken for granted. I love seeing families faces light up as they turn on their solar lantern for the first time. It is truly magical. We have been so lucky to donate these lanterns to those in need as we explore Annapurna base camp or go Gokyo lake trekking. Thank you Solight for helping us to give the gift of light. Feel free to visit https://solight-design.com to learn more and join us on our adventure trekking tours in Nepal!